A barista is a person who prepares and also generally serves espresso-based coffee drinks. In the United States, the term barista is also often applied to coffee shop employees who prepare both espresso and regular coffee drinks. Although the term barista technically refers to someone who has been professionally trained in preparing espresso, it may also be used to describe anyone with a high level of skill in making espresso shots and espresso drinks, such as lattes and cappuccinos. The word barista originated in Italy, where it means a "bartender" who serves alcoholic and non-alcoholic drinks, including coffee and espresso drinks. The Italian term is gender neutral when singular. In English, it is gender neutral when singular or plural (baristas), but in Italian, it is gender-specific when plural, either the masculine "baristi," which means "barmen" or "bartenders," or the feminine "bariste," which means "barmaids." In the United States, this term is limited to servers of coffee-based beverages and does not include those that prepare and serve alcoholic beverages. Generally, baristas working in coffeehouses, coffee shops, or coffee bars operate commercial espresso machines (rather than home espresso machines). While their job may sound simple, commercial espresso machines range in difficulty. Some are manual and require immense skill, training, and ability to adapt to the nuance of each batch of coffee, the day's weather conditions, the drinker's preferences, and other factors. Other machines are "super-automatic," requiring no more than the loading of whole beans and the push of a button. Since baristas work the more highly-detailed machines, they must learn the complicated steps of preparing espresso shots. Beyond making espresso, baristas also generally foam, froth, and steam milk to make a wide range of espresso-based drinks and prepare coffee drinks, such as French press coffee, pour over coffee, and drip coffee. It is a barista's job to know the differences between drinks like the Cortado, which is made with equal parts densely steamed milk to espresso, and a flat white, which is equal parts steamed and textured milk and espresso. Finally, for many baristas, customer service is a key part of their job. They are serving customers the drinks they have prepared and many people interact directly with the barista. In larger coffeehouses, the baristas may work behind the scenes and not interact with customers, but in smaller shops, it's likely that the same person taking the drink order will then be making the drink. While it is possible for a barista to acquire their job skills by attending barista training courses, they are usually taught on the job by longstanding employees. Many baristas take great pride in their skills and spend years honing specific techniques for crafting perfect drinks. More experienced baristas are often tasked with training new employees. The training can range from making everyday drinks to creating specialized drinks to learning how to use the complicated machinery. This obsessive tendency to improve one's craft led to local and international barista competitions. Although formal barista competitions originated in Norway, the most famous and respected barista competition is now the World Barista Championships (or WBC), which like the Olympics, is located in a new country every year. Competitors in the WBC are tasked with preparing 4 espressos, 4 milk drinks, and 4 original signature drinks to exacting standards in 15 minutes. In addition to skill in manually preparing espresso shots and espresso drinks, some baristas are known for specializations such as latte art, coffee roasting, in-depth coffee knowledge, or making cold-brewed coffee. You're probably used to seeing leaves or hearts on top of your milk and espresso drinks. This flair for creativity isn't as easy as it looks. 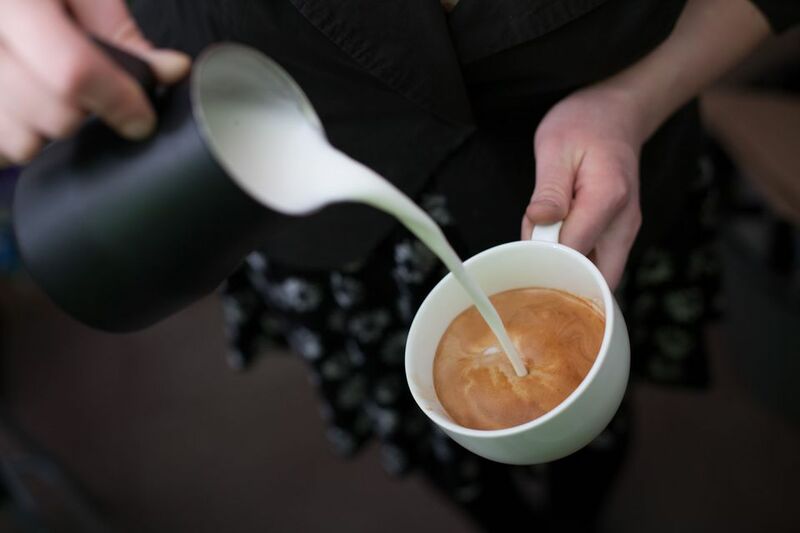 It requires pouring the steamed milk in such a way that as it rises to the surface it forms a particular design and can get increasingly complicated as a barista's skills increase. In addition to one who makes espresso and related drinks, the term barista may also refer to Barista Magazine, the coffee shop Barista PDX in the espresso-loving city of Portland, Oregon, Barista Prima Coffeehouse K-Cups, or the coffee chain Barista India, which is a Lavazza company.